Honourable Chief Minister of Maharashtra to Inaugurate Akshaya Patra’s Nagpur Kitchen. 19 August 2016, Nagpur:The Akshaya Patra Foundation is opening its first kitchen in Maharashtra at Nagpur on August 20th, 2016. The kitchen has the capacity to serve 5,000 children in the area, every school day. This new kitchen will be inaugurated by the Honourable Chief Minister of Maharashtra, Shri Devendra Fadnavis, who has been a vital well-wisher and supporter of The Foundation. The event will be presided by Shri Chanchalapathi Dasa, Vice Chairman, The Akshaya Patra Foundation. The event will also be graced by Honourable Nagpur Guardian Minister, Shri Chandrashekhar Bawankule; Honourable Mayor of Nagpur, Shri Praveen Datke; Honourable Deputy Mayor of Nagpur, Shri Satish Vitthalrao Hole; and Smt Vandana Tilak, Guardian Donor of Akshaya Patra, Nagpur. Shri Vyomapada Dasa, President - Akshaya Patra, Nagpur will be present during the event. The inauguration will be followed by a symbolic serving of meals to the children followed by a flag-off ceremony of customised food distribution vans that will be used to deliver fresh, nutritious meals to the schools. Speaking at a press conference held this evening, Shri Chanchalapathi Dasa expressed his gratitude and thanked Shri Devendra Fadnavis and the officials of the Government of Maharashtra for their support and encouragement. Akshaya Patra is grateful to Mr Ravi and Smt Vandana Tilak who have sponsored this kitchen in the loving memory of Bapu Datar. The Foundation is also thankful to The Bank of Tokyo for their steadfast support. The Akshaya Patra Foundation is a not-for-profit organisation implementing the Mid-Day Meal Programme in Government and Government aided schools. Its state-of-the-art centralised kitchens have become a subject of study and they attract curious visitors from around the world. In partnership with the Government of India and various State Governments along with continuous support from philanthropic donors and well-wishers, Akshaya Patra has expanded to 26 locations in 11 states of India, Maharashtra being the latest inclusion. About The Akshaya Patra Foundation: The Akshaya Patra Foundation is a not-for-profit organisation headquartered in Bengaluru, India. The organisation strives to fight issues like hunger and malnutrition in India. By implementing the Mid-Day Meal Scheme in the Government schools and Government aided schools, The Akshaya Patra Foundation aims not only to fight hunger but also to bring children to schools. Since 2000, the organisation has worked towards reaching more children with wholesome food on every school day. Akshaya Patra Foundation is continuously leveraging technology to cater to millions of children. 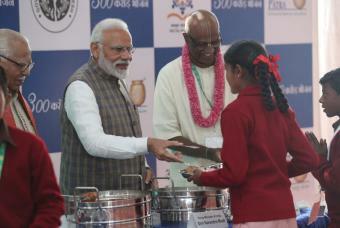 Akshaya Patra has grown from humble beginnings of serving just 1,500 school children across 5 schools in Bengaluru to serving 1.5 million children from 12,652 schools across 10 states in India. Today, The Akshaya Patra Foundation is the world’s largest (not-for-profit) run Mid-Day Meal Programme serving school lunch.